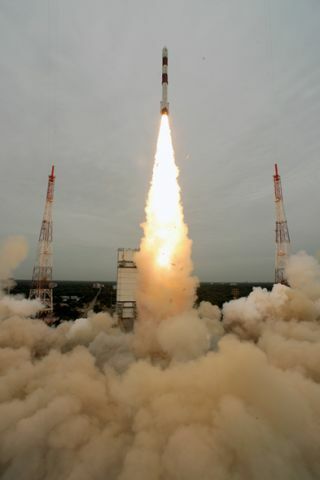 India launches its 100th space mission on Sept. 9, 2012, with the successful flight of this Polar Satellite Launch Vehicle carrying the Spot 6 communications satellite and Proiteres amateur radio satellite. The mission launched from India's Satish Dhawan Space Centre on Sriharikota Island. The PSLV rocket carried the Astrium Services’ Spot 6 commercial Earth observation satellite into low Earth orbit in a launch that represented a milestone in the gradual privatization of commercial remote sensing. Operating from the Satish Dhawan Space Centre, the PSLV also carried the 15-kilogram Proiteres amateur radio satellite, built by the Osaka I. The 1,569-pound (712-kilogram) Spot 6 satellite will be joined in its 435-mile (700-kilometer) polar low-Earth orbit by the identical Spot 7 in 2014. Astrium Services financed the Spot 6 and Spot 7 project without government support, and with no guarantee from French authorities of imagery purchases. The Spot 6 and Spot 7 investment totals about 300 million euros ($375 million), according to Astrium. Commercial Earth observation programs exist in Germany, Britain, the United States and elsewhere, but in these cases governments are investment partners, guaranteed customers or backing the projects in some other way. Astrium Services would have preferred that this be the case for Spot 6 and Spot 7 as well, but the French government, which invented the commercial Earth observation business in the mid-1980s with the first of the Spot satellite product line, decided that, with 100 million euros or more in annual revenue, the Spot satellite system was ready to leave the government nest. By not having invested in the program, the French government likely will pay higher per-image prices for Spot imagery. Spot 6 and Spot 7 are capable of taking black-and-white images with a ground resolution of 5 feet (1.5 meters). Multispectral imagery in blue, green, red and near-infrared, are captured with 19.6-foot (6-meter) resolution. Image swath, as it has been for the lower-resolution previous Spot satellites, is 23 square miles (60 square km). Spot 6 and Spot 7 are designed to operate for 10 years, double the life of Spot 5, which was launched in 2002 on a five-year life but remains healthy in its 509-mile (820-km) orbit. The two-satellite system, using the satellites’ ability to swivel off-nadir, will be able to revisit a given spot on Earth once a day. Spot 5 weighed about 6,613 pounds (3,000 kg) at launch, more than four times the launch weight of Spot 6. Spot 5 takes images with a ground resolution of between 8.2 and 32.8 feet (2.5 and 10 meters). While Astrium Services is flying solo for Spot 6 and Spot 7, the company has the exclusive commercial use of the French civil-military Pleiades high-resolution satellites. Pleiades 1A was launched in December. Pleiades 1B is scheduled for launch in 2013. Pleiades, which like Spot 6 and 7 operates in a 700-kilometer orbit, is capable of detecting images as small as about 20 inches (50 centimeters) in diameter in its highest-resolution mode. Swath width is 7.7 square miles (20 square km). The two Pleiades and Spot 6 and Spot 7 satellites will be positioned in orbit to maximize revisit time to give Astrium Geo-Information Services a commercial product portfolio designed to capture a piece of the high-resolution end of the market, which is the fastest-growing segment of the business, while not giving up its bread-and-butter medium-resolution customers.